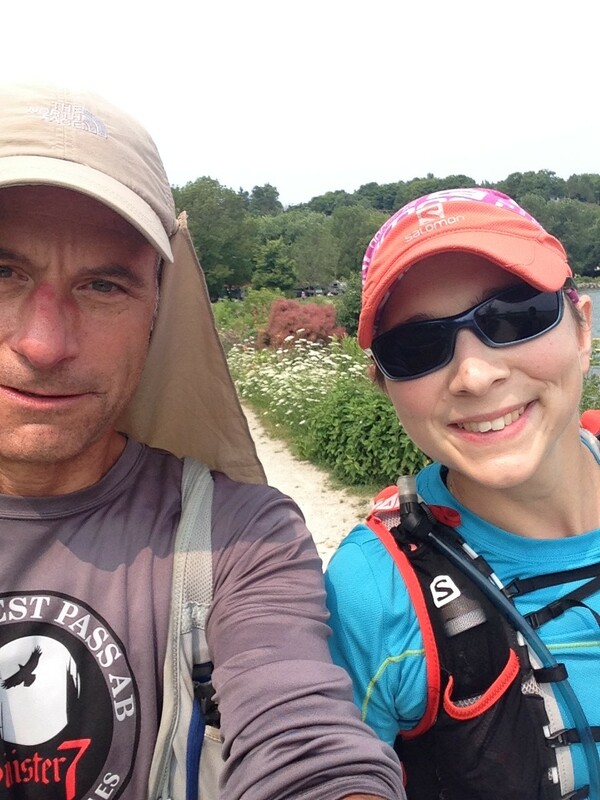 I recently had the pleasure and honor to spend a full day as a running guide for the amazing blind trail runner Rhonda Marie Avery. If you thought you read that wrong I can assure you she really is a blind trail runner! 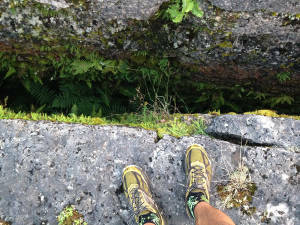 Rhonda decided to tackle one of the toughest trails in Ontario Canada, the Bruce Trail. 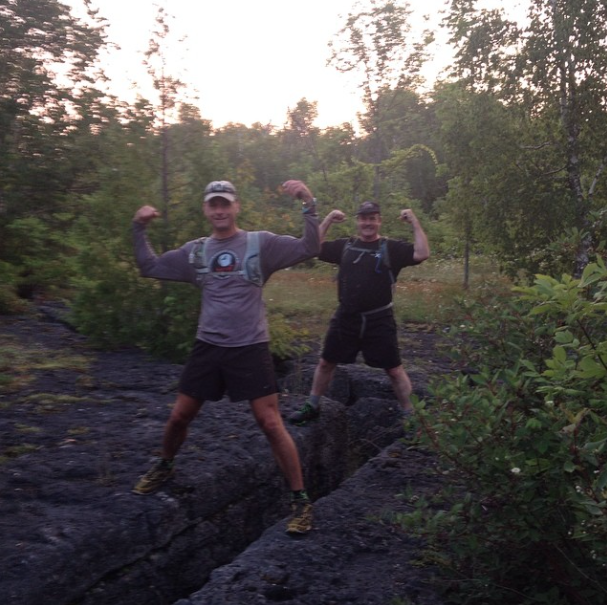 The Bruce Trail presents a seemingly never ending array of undulating technical terrain over it’s 885 kilometres. 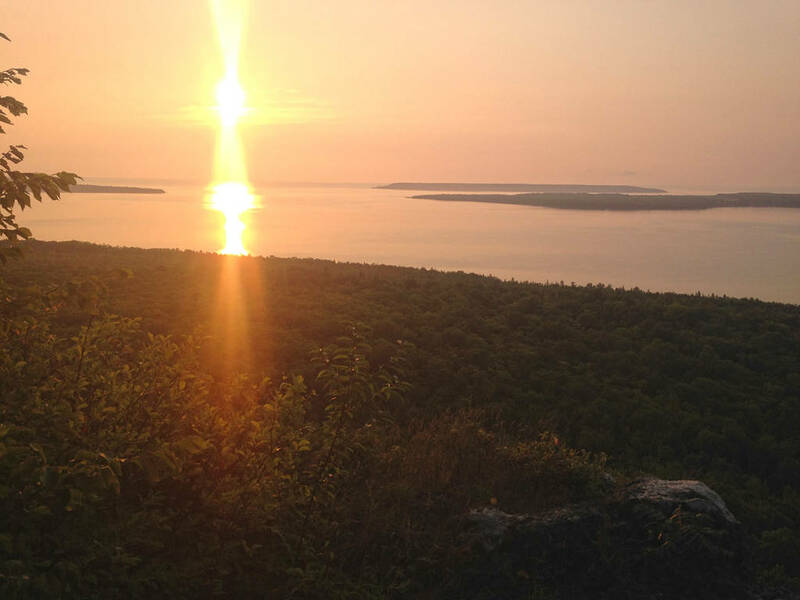 From the town of Tobermory at the extreme northern tip of the Bruce Peninsula, the trail travels continuously to Niagara Falls in the south. 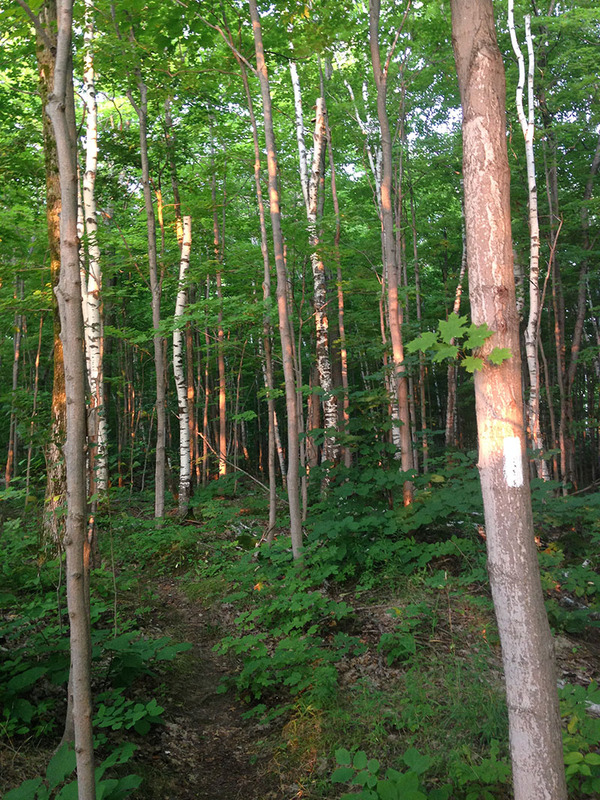 Following the amazing Niagara Escarpment over it’s course, the Bruce Trail has a hilly spine with plenty of elevation change and breathtaking views. Rhonda needs to be sure to have early bedtimes and an early start to the day. The approximately 45 kilometres she covers each day is best undertaken in the cool of the morning before the sun gets too hot. Another reason for such an early start is the length of time it takes for her to negotiate the trail and it’s technically demanding terrain. The run will last twenty days. 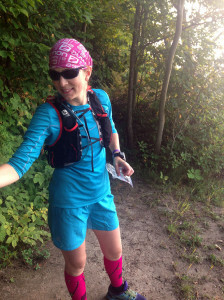 A blind runner requires guide runners, and a run of this length required two fresh guide runners for each day. One guide runner leads and navigates to ensure the excellent trail markers are in sight and that they are still on the trail. Behind the lead runner is the guide runner whose responsibility is to call out every root, rock and undulation in the terrain. Rhonda who runs directly behind the guide runner has an uncanny ability to time her steps to avoid every obstacle the guide runner calls out. The guide and lead runners swap positions for two reasons. One is that it’s mentally fatiguing to call out the terrain and two is that it’s good for Rhonda to hear a different voice and style of callouts. 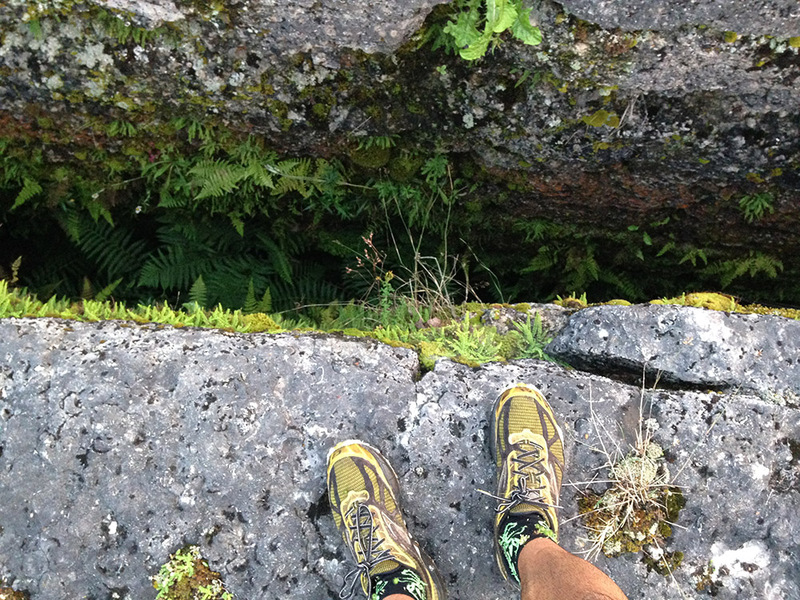 Having run the Bruce Trail for most of my life I can say that the roughness of the rocks, roots and hills provides a challenge to perfectly sighted runners. Lose your concentration for a few seconds and it’s easy to face plant! Rhonda’s accomplishment is all the more impressive given the fact that she is negotiating this terrain blind. Today is August 8th, 2014 Rhonda is carrying on with more than a marathon per day every day. My day is done and other guides have taken over. And so it goes, this rhythm of run, eat, sleep and make friends along the way. At the end a sense of supreme accomplishment, a pinnacle achievement and a lot of amazing memories. Let us not forget that Rhonda is doing this for a cause that can help many, Achilles Canada. 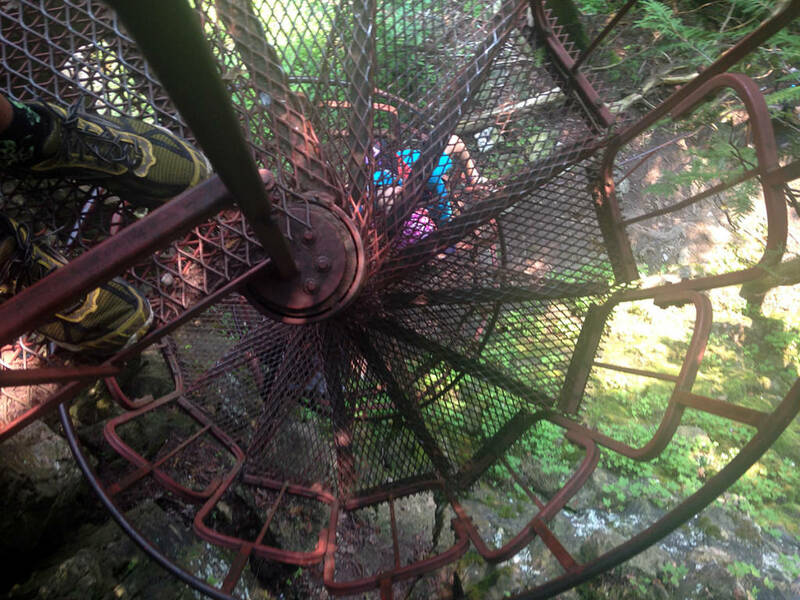 None of these activities are easy for me to manage without the help of Achilles Canada”This nonprofit organization connects those with disabilities with volunteer guides. “Over the years, they have helped me to take part in events from 5Km to 100 miles of running, 13km of tethered open water swimming, and 500km of tandem cycling. Without their involvement, I wouldn’t be possible for me to participate to this degree. Oftentimes, for the disabled athlete, getting to the start line is the most difficult task. As a disable endurance athlete, my goal is always to show up, do my best and put all concepts of my disability aside. Share the post "Bruce Trail Warrior"